EAW032799 ENGLAND (1950). 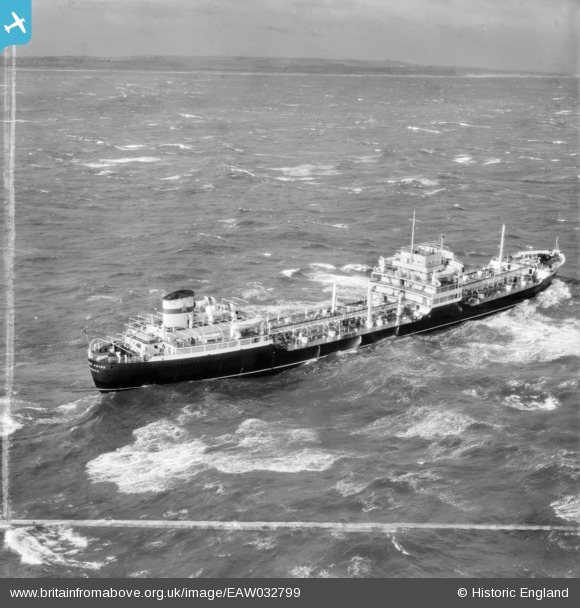 The London Pride at sea, Whitburn, from the south-east, 1950. This image was marked by Aerofilms Ltd for photo editing. Title [EAW032799] The London Pride at sea, Whitburn, from the south-east, 1950. This image was marked by Aerofilms Ltd for photo editing. What is this? a tall tower or a blemish? Could be Penshaw monument, visible from most places around the NE area. This looks like Souter Point Lighthouse. The hills behind look too high, the North york moors look a better fit. I think that this looks like the lift tower at Marsden Grotto, near South Shields. What does anyone else think? Steam rising from the top of cooling towers. I've just been looking at some other cover of Whitburn Colliery, and there are cooling towers on the east side of the mine. I'm happy with the details. We'll update the catalogue and post the new location data here in due course. Image EAW032796 is taken in the same area. It is easier to identify Marsden bay and Rock.